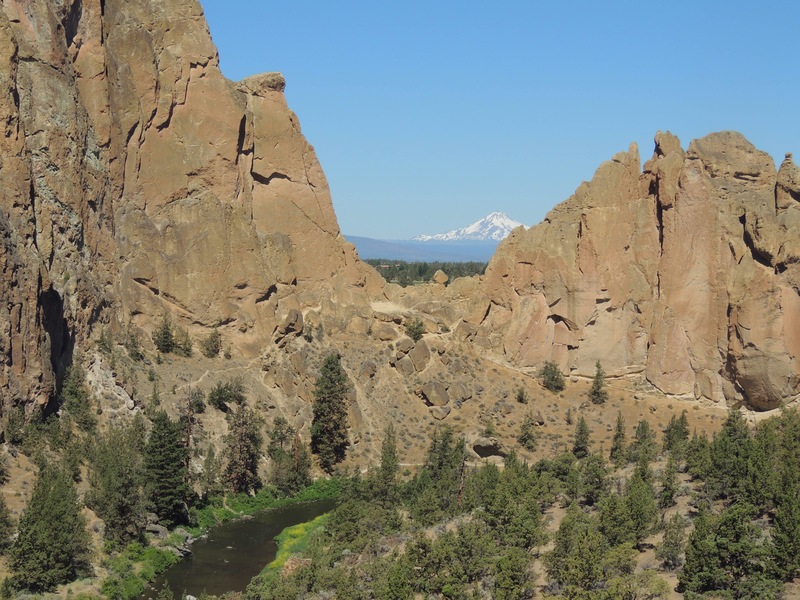 On Tuesday, July 11th, we decided to take a little day trip to Smith Rock State Park, north of Redmond, Oregon, as we heard that people liked to hang out there…. ….and we mean that quite literally! 😃 And while this outcropping is internationally known for its tremendous rock climbing opportunities, we also wanted to see the geology and the hiking trails available to those of us who prefer to keep our feet on terra firma. In addition we wanted to check out the volunteer opportunities available, as our friend Lisa and her late husband Hugh had worked at the visitor center a while back. 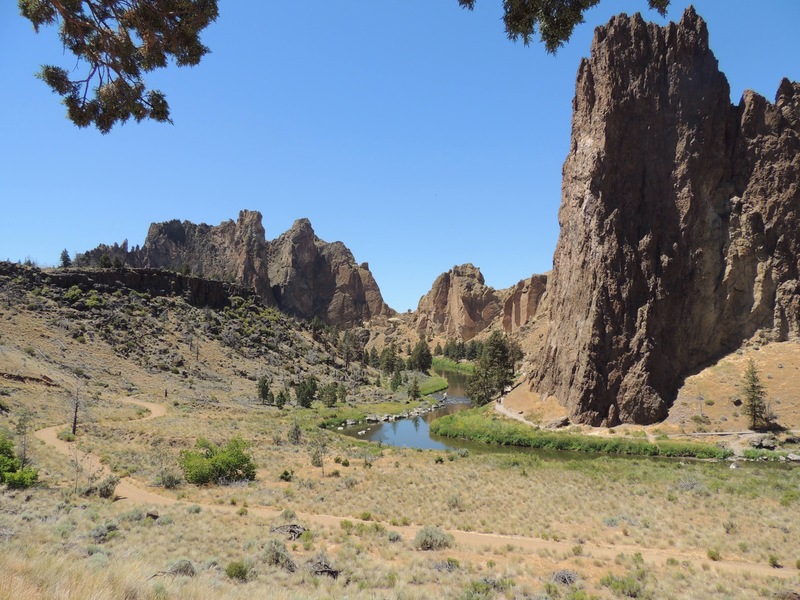 This volcanic gem sits on the northwest rim of the Crooked River Caldera….a recently discovered supervolcano that last erupted 29 million years ago and is considered extinct. For reference, Prineville sits smack dab in the middle of that caldera, 19 miles south east of Smith Rock….so we are talking a very large crater. 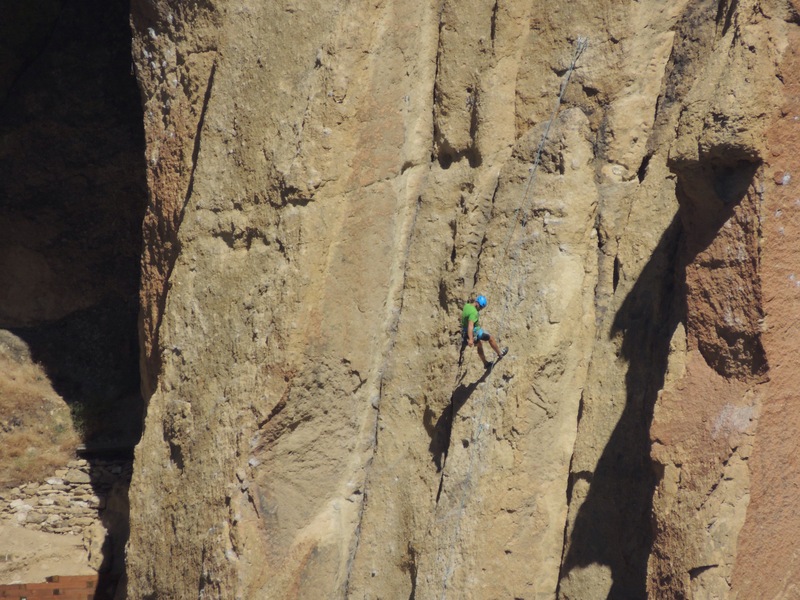 The makeup of Smith Rock is volcanic tuff and basalt, and the geologic features are quite varied in their structure, which makes for good rock climbing. …and we were glad that none of them had to use the equipment seen here that is provided by the state park! We hiked a little ways on the Canyon Trail, then decided to cross the footbridge and check out the River Trail, which skirts the base of the mountain. One thing is for certain: the scenery was outstanding! This photo shows Mt. Jefferson peeking through Asterisk Pass. We never get tired of seeing the line of snow-capped stratovolcanoes hovering above the high desert landscape we are in. We definitely enjoyed our afternoon at Smith Rock State Park. 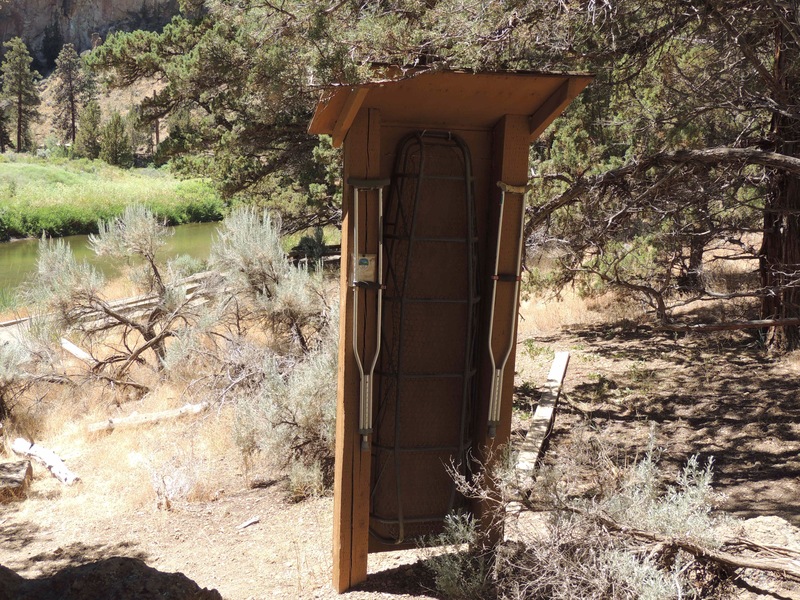 With it being so close to our base at Prineville Reservoir, we would love to come back and do more hiking. Stay tuned for that and more, as we continue to explore this beautiful slice of Oregon! Those rock formations are amazing. It looks like a great place to watch the climbers. I didnt realize there were so many volcanic formations in Oregon. It’s incredible how much volcanic activity has shaped the state, Bonnie. You are in for a treat when you and Fred get here! I’m with you about keeping my feet on the ground but it is fun to watch the climbers. It sure is, Gaelyn. That guy in the blue helmet tried three times to get above that overhang, but finally had to call it a day. He will make it someday, for sure! I think we’ll have to put this on our to do list! 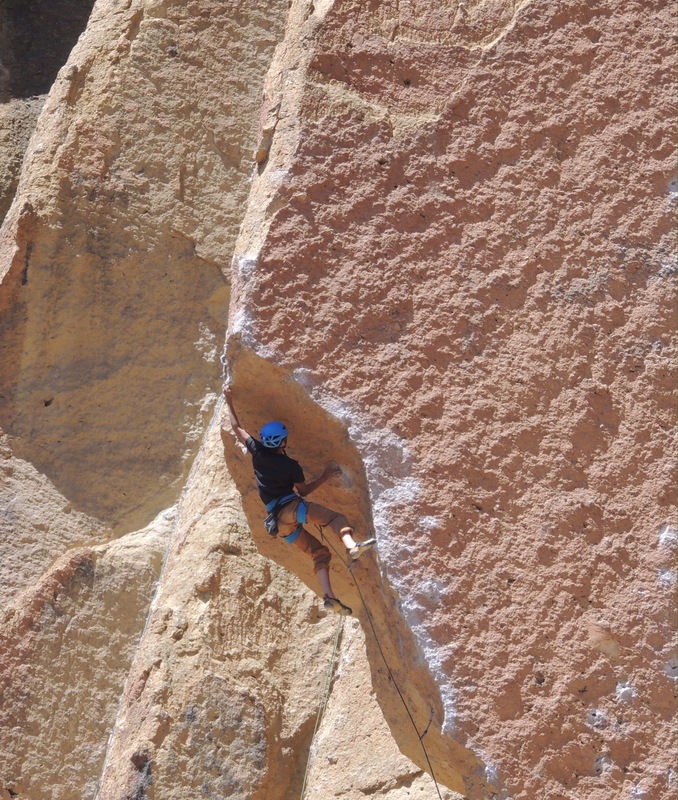 We enjoy watching rock climbers and wonder what it would be like to actually climb one of those rocks….maybe someday! 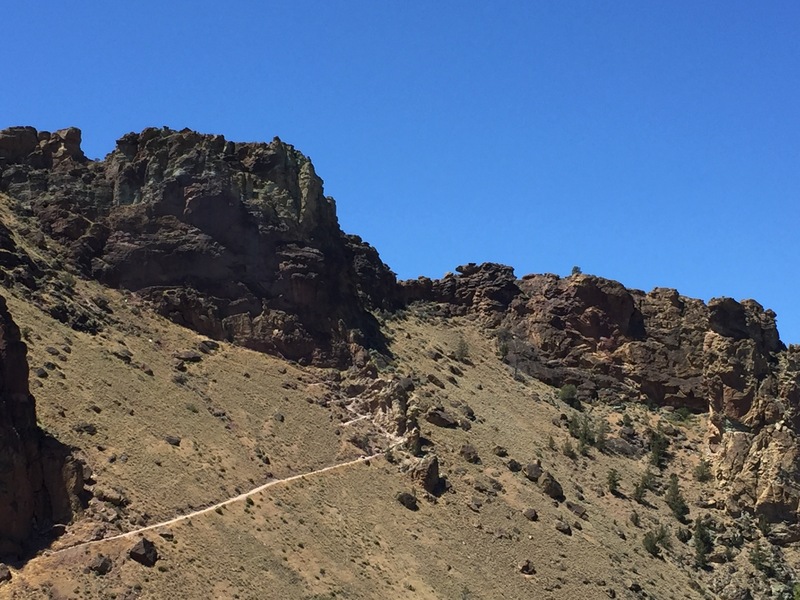 Smith Rock SP is an interesting spot. We aren’t fans of starting a hike from the top…only means trouble at the end. It is a long climb up and out from the river. We did Misery Ridge and have our story in a blog post so you check out the trail if you are thinking of heading back. The volunteer in the VC said the ranger prefer you start the hike from the back side and come down the front which is right by the bridge. It is very steep which isn’t too bad. You just stop and rest you need to. It was the peas size gravel on the steep sections that made coming down so challenging. Hiking poles are a must for this hike. I am not a fan of gravel and steepness. I can’t seem to relax which makes it so hard on my knees. But we made it. Great information, Pam! Yes, that hike up from the river at the end is steep, and I imagine it’s really tough after Misery Ridge! Any hike of length brings out the poles, as our knees let us know otherwise! 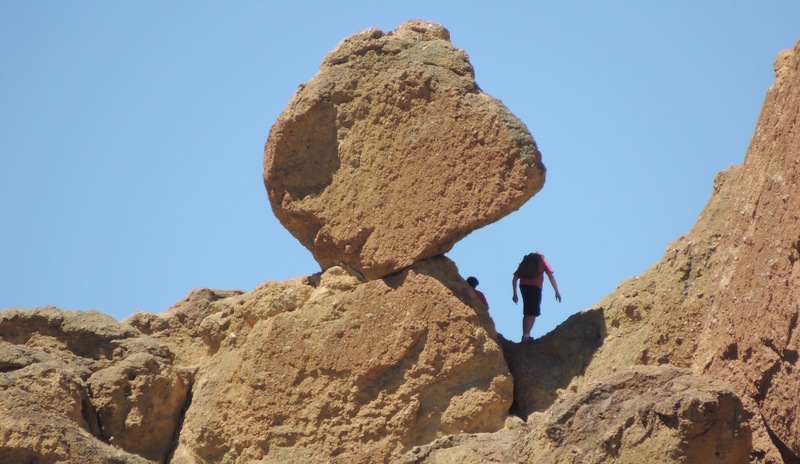 Love the pics of the rock formations – but the climbers are scary! I’d be so afraid of seeing someone fall! They seemed to know what they were doing, Kelly…but the crutches made us wonder! You have some wonderful photos of Smith Rock. Looking forward to hiking that trail sometime. We drive past it often, but not at the right time of year. Thanks, Sue! We really like this area. Being from the Midwest, we weren’t sure if we would.